This web contents files of my Ph.D. thesis which title is Stochastic Simulation of The Dynamic Behavior of Grain Storage Facilities. This work was carried out with the objective of developing a simulation toolset for performing analyses and evaluations of grain storage facilities. 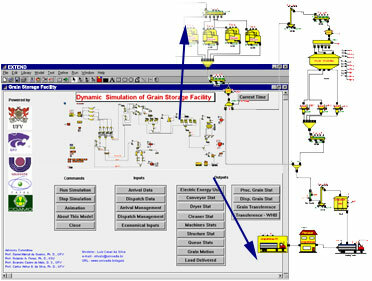 This toolset, a library called "Grain Facility," developed using the simulation ExtendTM, has a set of blocks that allows simulation of (i) receiving and dispatching activities, (ii) grain processing unit operations, (iii) operational decisions, and (iv) electrical and heat energy uses. Acknowledgements, Vita, Table of Contents, Abstract, and Resumo (Portuguese). Chapter I - Introduction, Problem Statement, Objectives, Thesis Organization, Limitations, and Scope. Chapter II - A Simulation Toll for Modeling Grain Storage Facilities. Chapter III - Grains Storage Facility Models, Verification and Validation. Chapter IV - Sensitivity Analysis Using A Grain Storage Facility Model. Chapter V - Scenario Analysis Related To Drying Sector Configuration. Chapter VI - Conclusions And Recommendation for Future Research.